This is the English edition of the first marketing book in Spanish to be adapted to the European Space for Higher Education, which has been written with the new requirements of the recent official degrees in mind. In addition to its theoretical presentation illustrated with many examples, each chapter starts with a business situation, and closes with a case study with practice topics, key terms and review questions, along with related Internet links and specific bibliography. 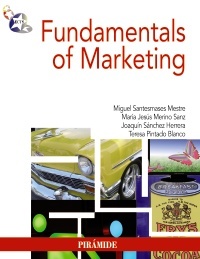 In addition, teachers and students are provided with complementary on-line material on the book&apos;s website: www.miguelsantesmases.com/fm.htmThis textbook presents the fundamentals of marketing, the market, the consumer&apos;s environment and behaviour, the marketing research, and the information systems. It later goes deeper into the marketing tools (product and services management, pricing, communication, sales, distribution and, lastly, the marketing plan), all supported by examples and case studies. Chapters dealing with relationship marketing, customer relations management, new communication technologies and emerging marketing techniques have also been included.Fundamentals of Marketing offers a modern approach, adapted to the new teaching methodologies which will make both the teaching and learning of the principles of marketing much easier. Fundamentals of Marketing: The Dimension of Marketing. The Market and its Environment. Consumer Behaviour. Research and Information Systems in Marketing. Principles in Marketing Management: Marketing Strategy. The Marketing-Mix: Products, Services and Brand Management. Price Strategies. Communication Management. Strategic Sales Management. Channel management and Distribution. The Marketing Plan. The Principles of Relationship Marketing: Relationship Marketing and Customer Service Management. Emerging Marketing Techniques: Marketing and new Technologies. New Trends in Marketing.